Whether you do the sodding job yourself or have a professional do it, do not lay sod on bare soil without first tilling in some organic matter such as ½ inch layer of peat moss, municipal compost, topsoil or other organic material prior to tilling. Otherwise, the chances of the sod establishing itself well are very slim. If the soil has sufficient organic matter and air in it, it will support a good population of earthworms and microbes. They will help the soil retain moisture, drain well and supply nutrients to the new grass. Removing the existing turf: If you hire a professional landscape contractor to install your sod, he is likely to remove the existing turf with a special tool that strips it up at just the right depth. This exposes the soil beneath. This is difficult for the average homeowner to accomplish over a large area without special equipment. Tilling the turf into the soil: An alternative to stripping off the old turfgrass sod is tilling it into the soil with a large rented self-propelled or tractor drawn tiller that will loosen the soil to a depth of at least 6 inches.. This automatically adds organic matter to the subsoil and aerates it. Sprinkle some slow acting granular lawn fertilizer on the newly tilled soil, then rake it smooth with a garden rake. Also use the rake to level the soil in areas that are uneven. Do not roll it; the weight of foot traffic will firm it sufficiently. 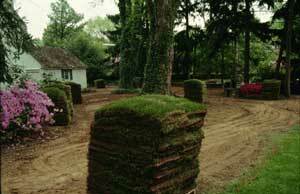 Always lay sod on soil that is moist but not overly wet. Water it thoroughly the day before the big job so it can drain overnight. One or 2 inches of water should be sufficient to wet it down at least 6 inches. Never lay sod on dry soil. Even if the sod is watered well immediately after it is laid on dry soil, root growth is retarded.